Are you marketing on Facebook, wondering what to post next or what's going to work best for your business? We've all been there, our creative juices slowing to a trickle and a concern creeping up that maybe Facebook can't deliver the results it used to. 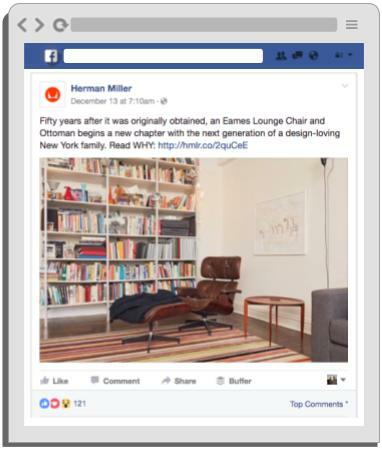 Before you go, check out these 42 Facebook Post ideas from some of the top businesses out there. See what they've done and feel free to steal the hell out of their ideas for your own business! Puppies: Doesn't matter what industry. Puppies work. Running series: Many Facebook Pages have several posts in a series. Watch out for key phrases before a colon to indicate a running series of Posts and content. Hashtags: Still used in abundance, hashtags are most frequently used to indicate product-related content or a running series. 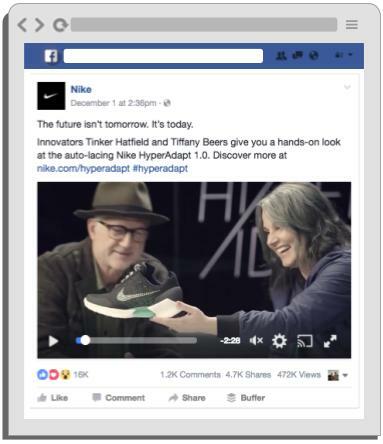 Video: It's no surprise, as Facebook has indicated pretty clearly that video content is (by-in-large) made more visible than other types of content such as images, links or straight text. 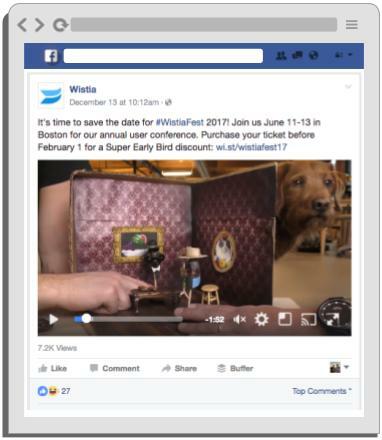 Tip: If you want to dive into video for Facebook, be sure to upload your file straight into Facebook's video player, rather than YouTube. 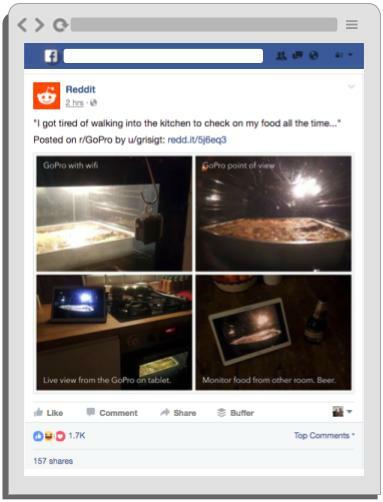 Facebook rewards posts with their own player higher than it does a Google affiliate's platform. 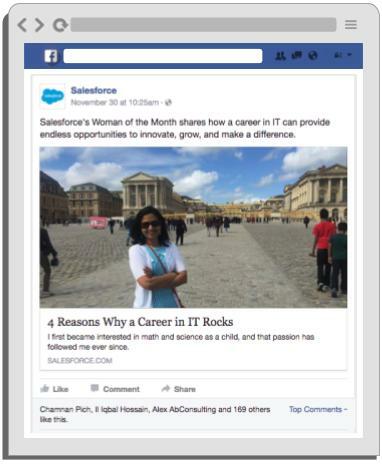 I've organized these Facebook post ideas into 21 B2C and 21 B2B examples. You're going to see a few dogs in this article. It's kinda a running theme for successful Facebook Pages. There's no getting around the fact that people like cute animals. 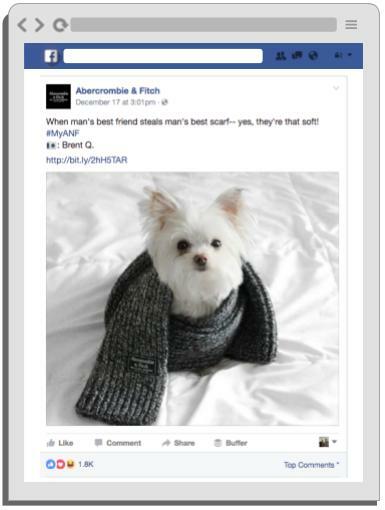 Abercrombie & Fitch doesn't beat around the bush when they found a Fan's pup curled up with one of their scarves. This was social media gold, and they knew it. Sometimes Fan segmentation works wonders. 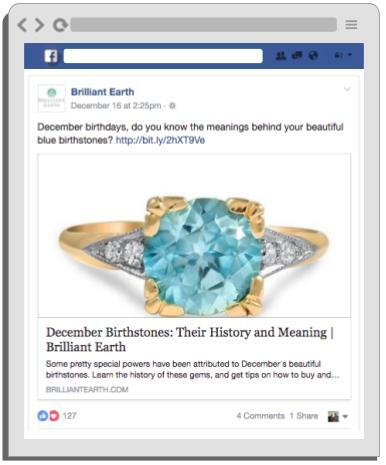 Brilliant Earth calls on all Fans with December birthdays as well as recognizing their target market may be interested in birthstones. 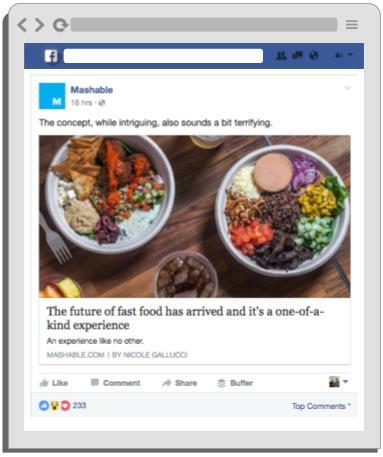 I also like the large, beautiful image here, which commands attention as users scroll their newsfeed. 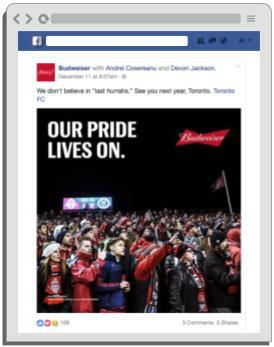 Budweiser taps into what their prospective customers are thinking about - such as Toronto's failure to win the MLS championship this year. 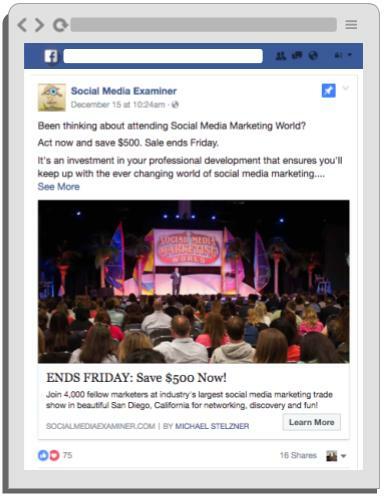 Your business should consider what your target market is thinking and feeling before diving into "current event" Facebook marketing. If you're selling knitting wool, for instance, it's unlikely your market cares as much about Toronto FC as Budweiser's does. Short gif videos (like this one, which is about 5 seconds) are a great way to grab the attention of users. 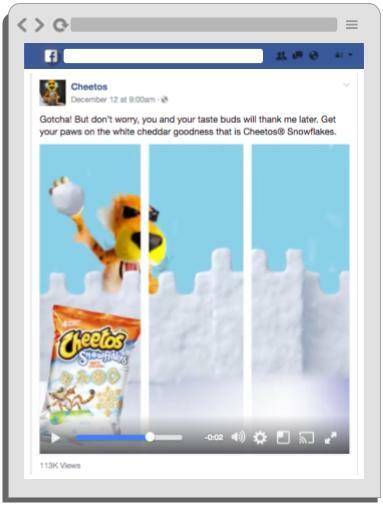 Cheetos is also grabbing attention by making users feel like they've been hit by a snowball, almost causing you to flinch from your screen. Half of Facebook marketing is grabbing attention. Converse's target market is an artsy, hipster one, and this image appeals to that market. Converse also inspires urgency with "before they're gone." Limited supply or "only until" promotions do better than never-ending ones as prospective customers feel inspired to act now. 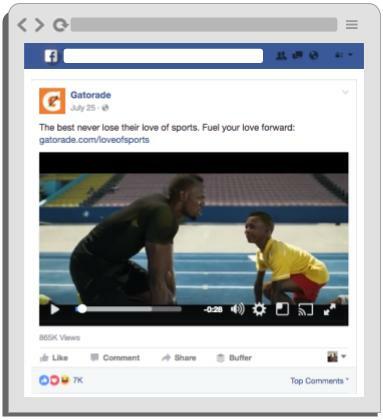 Gatorade taps into two elements with this post: celebrities and children. Both are appealing. Gatorade has done an excellent job with their brand by conflating the excellence of successful athletes with your excellence, brought about by their product. "The best never lose their love of sports. Fuel your love forward" is a great way to communicate that message. Herman Miller uses story as a way to personalize and humanize their brand and product. They also, subtly, speak to the quality and timelessness of their product by mentioning that the Eames chair and ottoman was obtained 50 years ago. When possible, add little value points like this to your Facebook story. They also include a Call-to-Action ("Read WHY"), which is best practice. I also like the "WHY" in caps. 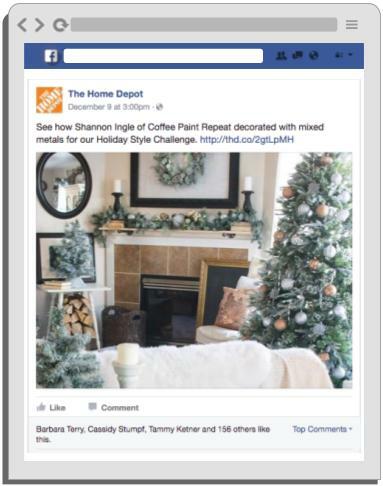 The Home Depot is running a recurring "Holiday Style Challenge" which showcases what can be done with the products they stock. Running a themed social media promotion during the holidays is a great way to get Facebook Fans to follow along, waiting to see what comes out next. I also like the user-generated element of this promotion, as "Sharon Ingle of Coffee Paint Repeat" is likely to share with her own network - thereby increasing this Post's reach. Kleenex, like Home Depot, runs a themed series of posts and content. Back in August they did a piece specifically for "back to school" for their #ShareKleenexCare theme, revolving around a ninth-grader's first day at highschool. 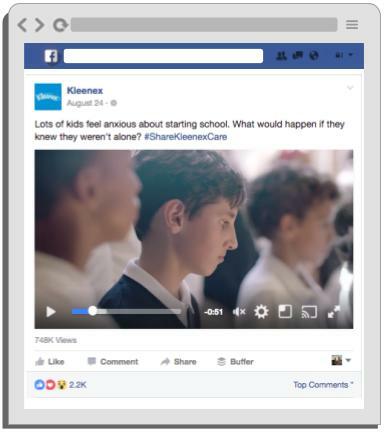 I like both the content (stories about children go over well with Kleenex' target market) and the recurring hashtag, which provides context for all the content they produce, makes it all easier to find and adds cohesion. This is a very straightforward post, but is a great example of product-promotion done well. 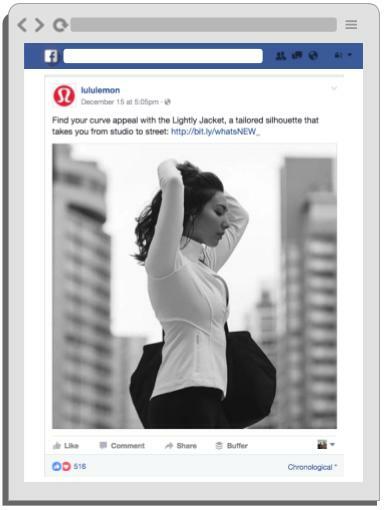 Lululemon's model is an everywoman, and the focus is on the piece of newly-released clothing. The copy explains exactly the value of this garment and uses actionable language - "Find your curve appeal." Little details, like the use of a personalized bitly link "whatsNEW," is also best practice and helps them to stand out. Who are we kidding? Link bait works for a reason. Mashable taps into our curiosity nerve as well as tempts us with words like "intriguing" and "a bit terrifying." Mashable also uses engaging language like "an experience like no other," which entices us but also causes us to challenge: "I'll prove them wrong. No way is it an experience like no other. I'll click through and see..."
This is a holiday-themed how-to post - a winning combination. 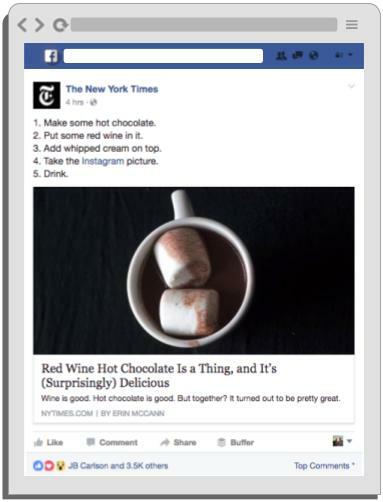 Your Facebook Posts should deliver value, and nothing does that better than a simple, 5-step walkthrough to wine and hot chocolate with whipped cream. This is the kind of content which people share with each other: controversial but intriguing. Nike taps into a couple best practices here: behind-the-scenes and story. They're showcasing the "innovators" who invented an auto-lacing shoe. Nike's Facebook Fans get a glimpse into the making-of as well as meet the people who create a product they love. 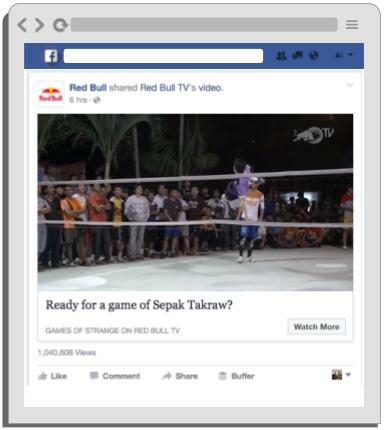 The video-format (rather than a link to an article) is also appealing, as it keeps Fans on-platform. 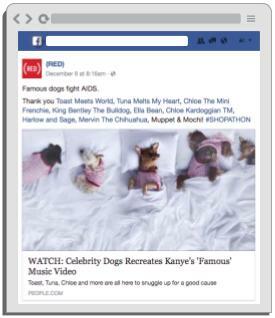 RED uses current events (in this case, the launch of a popular music video from Kanye West) to get their brand "on-trend." They do it, as well, with puppies. But not just puppies. Famous puppies. If you want to do all you can to make something go viral, there are a few recipes for success. And, seriously, popular music video + Kanye West + celebrity puppies with massive social networks = about as promising as it can get. Red Bull is known for extreme sports, and their Facebook Page is full of (exclusively) video, showing off awesome people doing awesome stuff. This short video, though, highlights something their Fans may not have seen before - sepak takraw, which is a southeast asian volleyball played without hands. It's a great idea to find content your Fans are unlikely to have seen before. Whether this is industry news or sepak takraw, of course, is up to you. 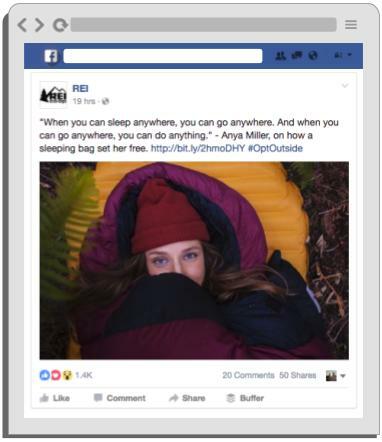 User-generated content is a great way for REI to increase engagement. Fans submit photos and REI posts them, @mentions the photographer, and occasionally tells their story on the blog. This is a winning strategy. REI also uses inspirational language to change the conversation. This post isn't about a sleeping bag, it's about "doing anything." Safeway goes behind-the-scenes as well as helping their Fans choose and create beautiful flower bouquets. 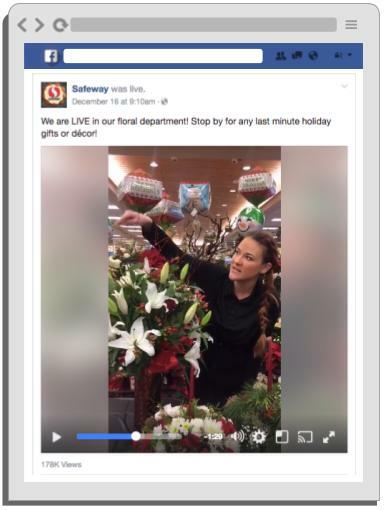 They've posted a five-minute interview and walkthrough with one of their florists (increasing the personality and personal touch of the brand), thereby showcasing a part of their business which sets them apart from other grocery stores. Every dad wants to be a "super dad." 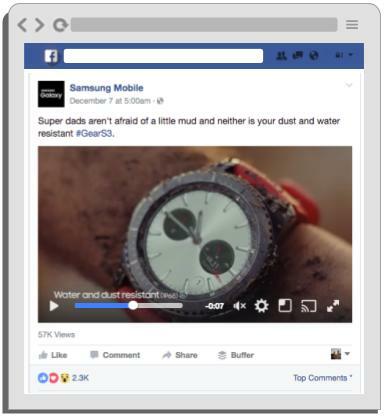 Samsung suggests that "super dads" wear their new GearS3 watch. The video, about 20 seconds, shows a rugged father gardening with his children - an idealistic view of parenthood which appeals to both the dads buying the watch for themselves and the Moms shopping for their partners this Christmas season. Samsung has also tapped into the hashtag game, using a product-focused hashtag "#GearS3" whenever they promote or mention the product line. This is best practice. Udemy plays with the popular phrase "binge watch" in their running content series "what would you #bingelearn?" in which they post responses to the question from their users. 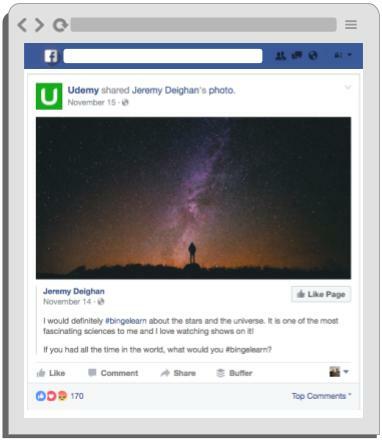 A great way to drive engagement with Facebook Fans is to ask a question, post the responses, and then ask it again. You'll get a better response-rate after people see that you're promoting their responses to the world. Volkswagon's "Owner Spotlight" series is a great way for Volkswagon to change the conversation: They don't just sell cars, they sell a way for Heather to keep her grandmother close to her heart. That's a substantially more powerful message. 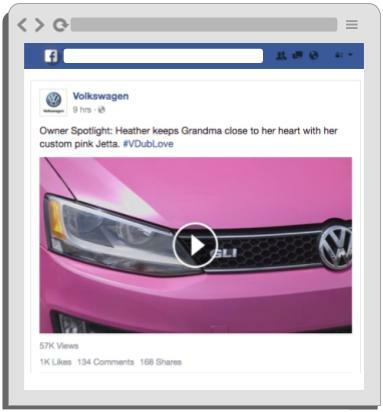 Volkswagon also keeps their Fans on-platform with a video, rather than sending them to a blog or url. The only link is for their #VDubLove hashtag. 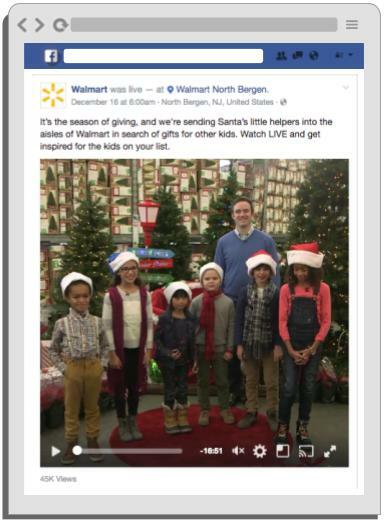 Walmart is the king of tapping into their customers and employees for content. This year (and with a holiday-themed content) they're tapping into adorable children and high-quality videography to get the job done. This video is substantially longer than those I'd normally recommend (almost 17 minutes), but Walmart knows what they're doing. Test longer-form videos for yourself, but start with 30-120 seconds first. 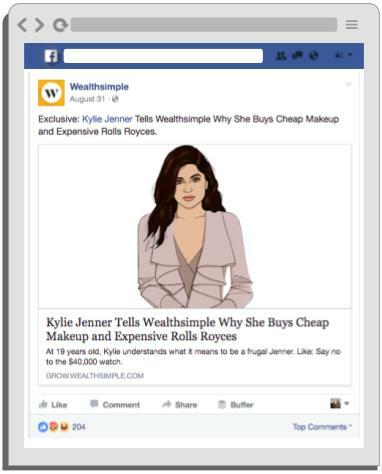 WealthSimple taps into celebrity and a great tagline to grab the eye of their Fans and Facebook users. It's not just the Kylie Jenner aspect of this post which works, it's also the "Exclusive" element and the intriguing headline "why she buys cheap makeup and expensive Rolls Royces." This post goes to show that, even if your business doesn't have access to Kylie Jenner, it doesn't mean you can't learn anything from the businesses that do. I love Adobe's consistent use of user-generated content. This example, from two artists, will be promoted on Adobe's behalf by those artist's entire social network. They showcase what can be done with their platform and encourage their users to share and promote on their behalf. WIth a little creativity, any business can work their brand message into a theme that people are already thinking about. 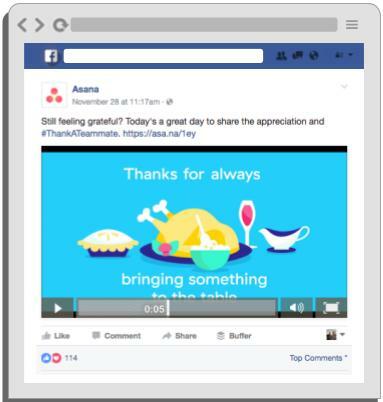 Asana, a teamwork-facilitating software provider, devoted a few Facebook posts to their #ThankATeammate campaign. And it doesn't even have to work directly with your product. Positive themes like giving thanks, celebrating and showcasing awesome things you've done never go out of style, even if they have nothing to do with your platform or service. Quotes, a best practice and recommendation from about 2011, are still en vogue. They still work, and still drive a lot of Shares. People like to get Liked, and nothing gets people Liking, like a bit of inspiration from Albert Einstein, Steve Jobs or the Dalai Lama. 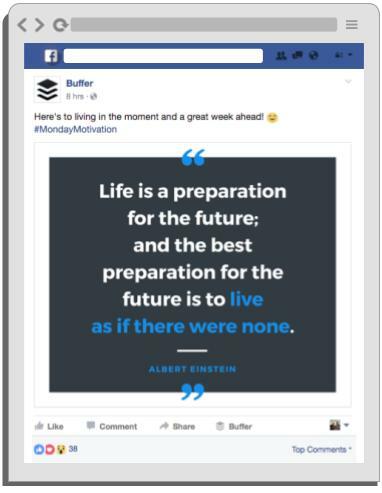 If you're going to do a quote, be sure you recreate it in your own brand colors (as Buffer has done using their Pablo platform, presumably). 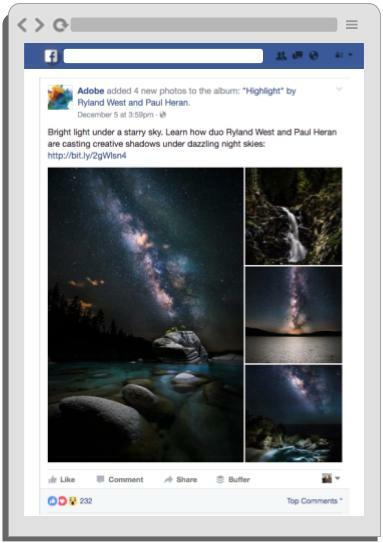 Make sure it fits the Facebook Post image size and is legible and clean. Then add a hashtag or two and your own (short) message. CSR (Corporate Social Responsibility) should be yelled from the Facebook rooftops. 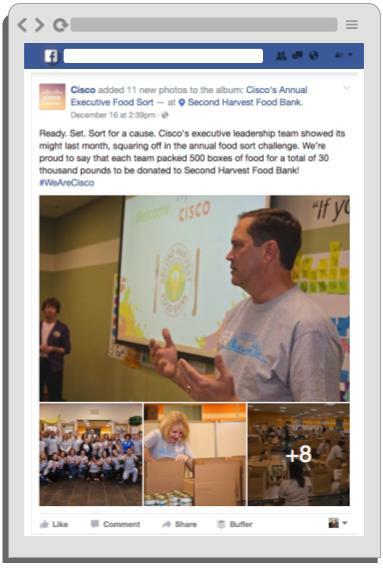 In this Post, CIsco does just that, showcasing (with an album, no less) their recent Annual Executive Food Sort - a holiday-themed volunteer program they run to give back. These events add personality to corporations, and remove some of the "facelessness" which can so often characterize them. If your business has sponsored a T-ball team, is running a food drive, or if one of your colleagues is running a marathon for charity, don't hide it. Evernote has added their own, on-brand, copy to the Post. They could have just said something like "keep your eye on the prize!' here, but they didn't. The copy they've added relates to their platform - an organizational and sharing app with a prominent checklist feature. Be sure the quotes you choose are in some way related to your business, or you'll struggle for success. 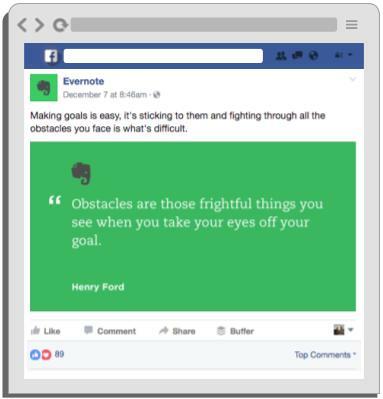 Quotes work well for software or App companies, who may not always have the most thrilling content for their Facebook Fans. 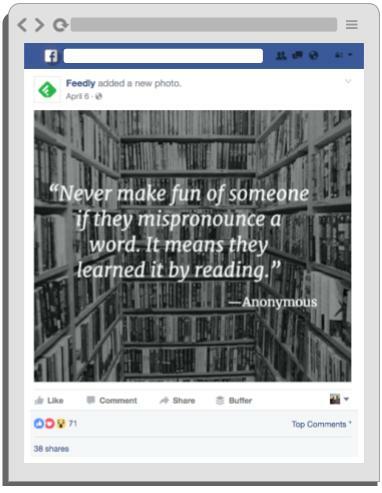 Again, Feedly has taken a quote which relates to their business - software devoted to compiling content RSS feeds, allowing members to easily find all kinds of educational content - and inspired great share numbers with it. Hootsuite taps into the reliability of dogs here, with a 40 minute video of all their office dogs running around and playing in the software company's log cabin-esque Vancouver office. 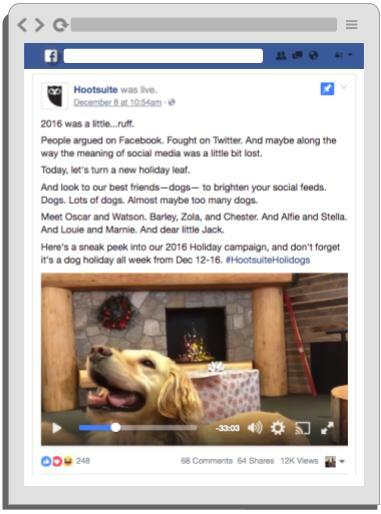 Hootsuite has actually devoted a week to #HootsuiteHolidogs, using the fun and cuteness of "Oscar, Watson, Barley, Zola, Chester, Alfie, Stella, Louie, Marnie and Jack" to liven the spirit after a tough 2016, and bring a bit of personality to their Facebook Page. 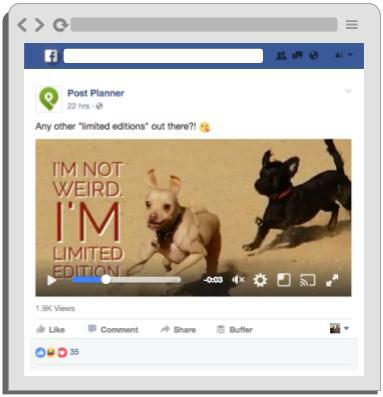 If you have a dog or business mascot, consider featuring them to add some personality and fun to your Facebook content. InVision does a feature release in the form of a video here, showcasing a new element of their App visualization platform. If you're going to do a feature or product release, be sure you put the release in the best possible light. A video is a great call, so long as it's done professionally and makes your release look fantastic. Otherwise, stick with screenshots or high-res images. Featuring customer testimonials is great way to get user-generated content which talks about your brand in a positive light - without you doing it yourself. Testimonials feel more unbiased than anything which comes from your own mouth (or fingers). 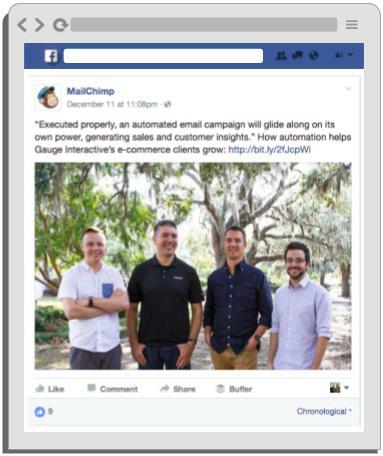 Mailchimp features their customers "Gauge" - both showing their faces (which increases trust) and their objective feedback about email automation. 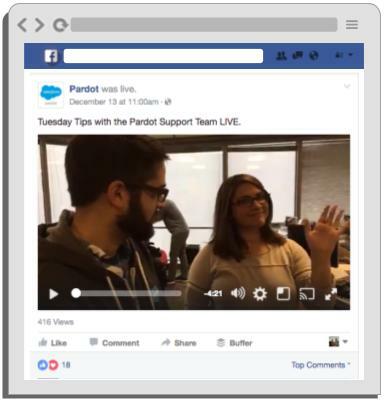 Going behind-the-scenes at your business' office, especially in a running content series ("Tuesday Tips) is a great idea. It introduces your prospective customers to your business without shoving product in their face. The informality of this video is also great. It's unscripted (pretty much) and feels natural. Your Facebook Fans want to meet the real you, not the posed, perfectly-lit version of yourself you'd put on a billboard. People love to be "limited edition," and they love funny dogs (again). This post has both. PostPlanner has also asked a question in this post, which prompts Fans to answer. The question "are they any other" also implies that PostPlanner is "limited edition" and people love to feel included in a club. November was not "women's month" (that's March) but, smart businesses make their own themes. Salesforce has a "woman of the month" every month, and showcases both their inclusivity of women in tech as well as tells a story. This is a simple blog article Facebook Post, but the running content series, great (personal) image and a bit of blurb makes it a winning one. 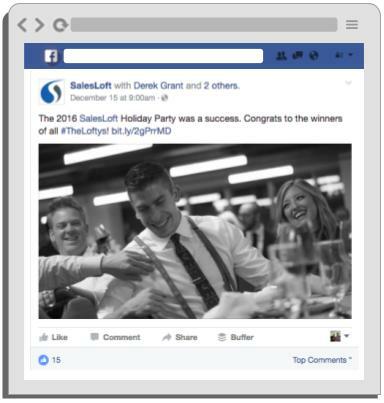 SalesLoft does a great job here of showing who they are as a brand: fun (people are laughing) but also professional. Use Facebook to both promote your products but also promote your business. Sure, your product looks great, but what sets you apart from your competitors? In SalesLoft's case it's a smiling employee and a reference to #TheLoftys, which make Fans smile even without knowing what they are. Won an award? Don't hide it. 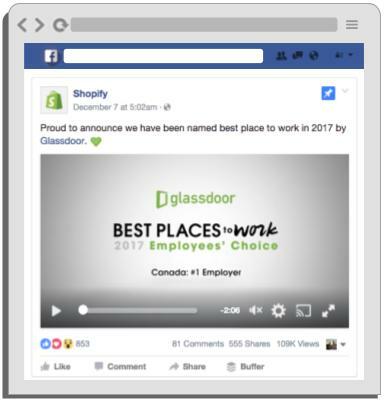 Shout it as loudly as you can from your Facebook Page, as Shopify has done here. Whenever someone unbiased says you're a great place to work or have a great product, post their content without any major comment. Let their acclaim speak for itself without you. No spin. The image also shows the popularity of this conference, which adds to the urgency of the situation by implying that these tickets might be taken up soon. 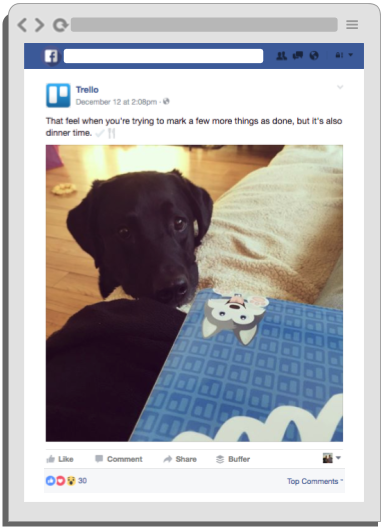 Trello has also added their own mascot into this image (Taco, the dog on the blue paper in the middle). Dogs are great, your business' dog is better. A creatively-done video with little characters, music, and a good length. A hashtag to keep all the #WistiaFest content organized, increase Reach and allow people to find it easily. Time-based urgency with "Purchase… before February 1 for a Super Early Bird Discount." Baxter (the Wistia mascot) in the background, just hanging out. 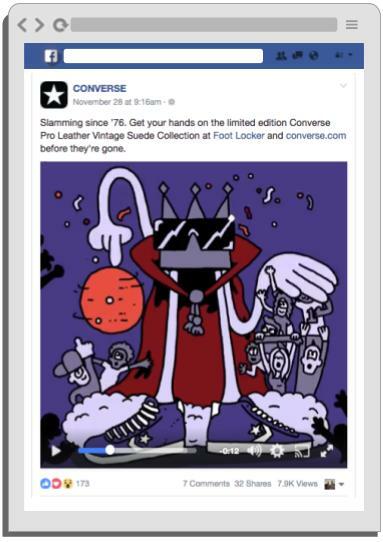 Your product launch should either be a video or an image gallery. Showcase your product and the excitement people were feeling when it went out. 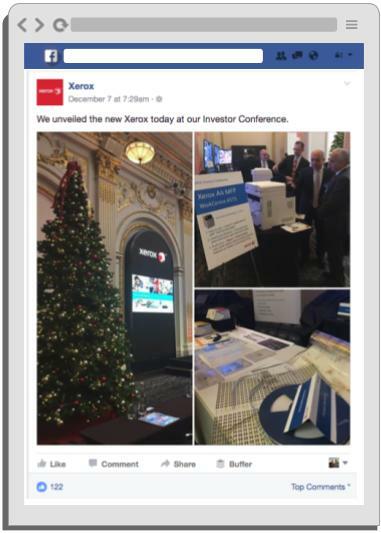 Xerox also wraps in the holidays, with a subtle featuring of the Christmas tree. 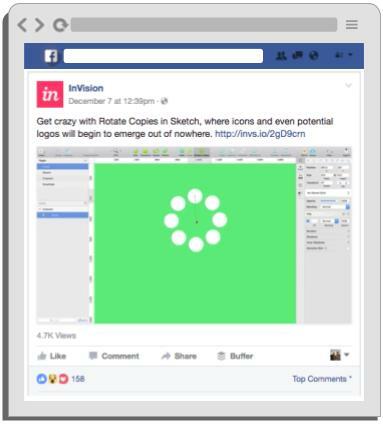 Hopefully these Facebook post ideas will give you some inspiration for your own business. There's nothing wrong with finding "inspiration," so long as you make it your own. Have any questions or comments about the posts in this article? Let me know in the comment section below!